Start by untangling the cords and removing any accumulated dust. Use electrical or masking tape to make tags identifying each cord. Zip ties and binder clips are perfect for bundling cords together. Place Command hooks along the back edge of a desk, table or bookcase to suspend the cords. If you use binder clips, you can simply hang the metal clasp from the hooks. Self-adhesive cord channels can be painted to match or contrast the wall color. You could also use a plastic shower rod cover, jute rope or spiral wire and cable wrap as covers. If you enjoy crafts, why not make a DIY no-sew cover? Use clear sealing tape to fasten cords behind furniture or up the length of table legs. Coil the wires and place them in an attractive wicker basket that serves as a nice visual element for your decor. 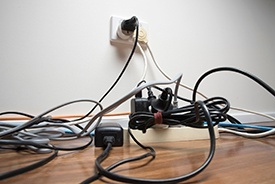 A table or desk drawer also makes a handy spot to hold wires. Floor covers work well with our hardwood-style floors. They're available in different colors and finishes as well as a stainable option. Put the cords inside a decorative box placed on a shelf or entertainment center. Cut a hole on each side for the wires to pass through. Recycle toilet tissue cores and dress them up with some washi tape to hold wires. Stand the cores on end inside a box and use it to store extra cords. Some power strips come with built-in cord organizers. Create a charging station by putting a power strip inside a decorated shoe box and cutting holes corresponding to each outlet. Night stand drawers also make good hidden charging stations. Use your creativity to make a personalized fashion statement out of the cords! Have you discovered a clever way to clean up the tangle of cords and wires in your Springs luxury apartment home? Share it with us in the comments!